New style for your watch! Give your XLYNE QIN XW Prime II a new style with one brandnew exchange watch band! The vigorous cognac light brown of the watch band in combination with the black chrome watch case imparts your QIN XW Prime II Smartwatch a classic look. The watch band is made in high-value leather. This guarantees a convenient wearing comfort and a long lifespan. The exchange of the watch bands is made with the provided exchange-tool quickly and easily! XLYNE exchange watch bands for the QIN XW Prime II are also available in the colours Carbon red black and Navy blue. Length (long side): 125mm, Length (short side): 85mm, Width: 22mm. The vigorous carbon red black of the watch band in combination with the black chrome watch case imparts your QIN XW Prime II Smartwatch a thrilling look. XLYNE exchange watch bands for the QIN XW Prime II are also available in the colours Cognac light brown and Navy blue. The vigorous navy blue of the watch band in combination with the black chrome watch case imparts your QIN XW Prime II Smartwatch a spectacular look. XLYNE exchange watch bands for the QIN XW Prime II are also available in the colours Cognac light brown and Carbon red black. Give your XLYNE NARA XW Pro a new style with one brandnew exchange watch band! The vigorous carbon red black of the watch band in combination with the silver watch case imparts your NARA XW Pro Smartwatch an exciting look. XLYNE exchange watch bands for the NARA XW Pro are also available in the colours Cognac light brown and Navy blue. Length (long side): 125mm, Length (short side): 85mm, Width: 24mm. The vigorous cognac light brown of the watch band in combination with the silver watch case imparts your NARA XW Pro Smartwatch a classic look. XLYNE exchange watch bands for the NARA XW Pro are also available in the colours Navy blue and Carbon red black. The vigorous navy blue of the watch band in combination with the silver watch case imparts your NARA XW Pro Smartwatch a spectacular look. 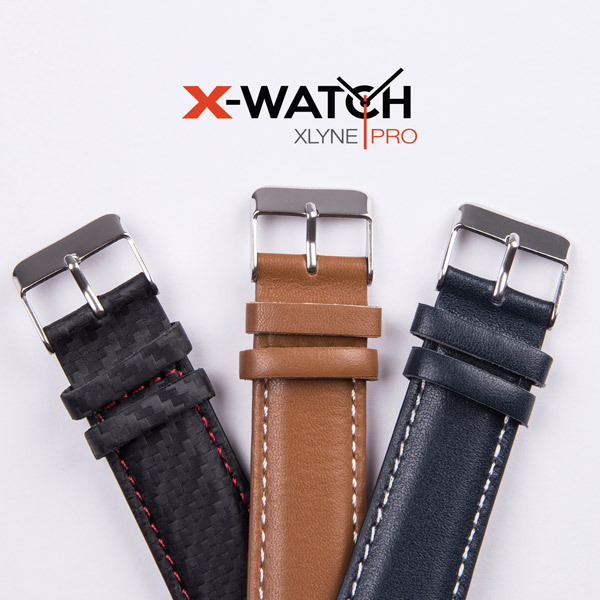 XLYNE exchange watch bands for the NARA XW Pro are also available in the colours Cognac light brown and Carbon red black.